Dr. Mike Catton passed away at Basildon Hospital on Friday, June 8, 2012. He leaves behind two sons, two daughters, eight grandchildren and two great grandchildren. Dr. Mike Catton was a well known local G.P. from Little Thurrock. Born in 1926 he was brought up in West Thurrock and Grays. He did two years of national service in the RAF as a squadron leader working in several military hospitals. Dr Catton was awarded the freedom of London in 1957 and returned to Thurrock to practice as a GP in Chadwell St Mary. He also worked on the Port of London Authority’s medical services based at Gravesend and was a keen supporter of St John Ambulance and became the divisional surgeon. He also served on the research committee for Compressed Air Workers and spent time monitoring workers involved with the Dartford Tunnel and Tilbury power station constructions. 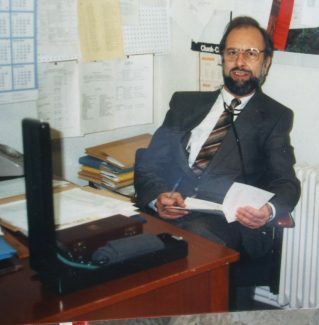 Dr Catton worked for a time in Algeria, and on his return worked for Waltham Forest Council as a senior medical adviser. He went on to be a medical inspector of factories, and carried out research on asbestosis and heavy metal absorption in battery industries. Mike Catton had many interests including a keen interest in history and was an early member of Thurrock Local History Society, inspiring his youngest son Jonathan Catton, who is Thurrock Council’s Heritage Officer, to become a member. Mike was also very keen on the Coalhouse Fort Project persuading many people to join the project and promote local interest in the fort. Whatever Mike did he did with great enthusiasm and it was contagious. Mike was afraid of flying so his solution was to learn to fly. That was Mike and he will be sadly missed.